Located in the Midwest of the United States, Minnesotan culture is largely influenced by its German and Scandinavian populations, but also recent immigrants from Mexico, Laos, Vietnam and Somalia. This mix of traditional and new cultures makes Minnesota a fascinating place to live, work and visit. A place known as the “Land of 10,000 Lakes” has many outdoor activities for visitors at places like Voyageurs National Park and Boundary Waters. Even the long, cold winters can’t keep Minnesotans inside. Other popular activities include snowmobiling (the snowmobile was invented here), cross-country skiing, snowshoeing, hiking, fishing and mountain biking. For cultural activities, visit the twin cities of St. Paul and Minneapolis for attractions like the Minnesota History Center, the Minneapolis Institute of Arts and the Minnesota Fringe Festival. International visitors will find art, culture and recreational activities throughout the Minnesota Cultural Compass guide below, or by visiting www.exploreminnesota.com. Mall of America. Photo by Jeremy Noble. The Cathedral of St. Paul is a historical landmark and popular attraction in the Twin Cities area. There is a free daily tour from Monday to Friday at 1pm. Learn about a native Minnesotan animal at the International Wolf Center in Ely. The center educates the public about wolves through exhibits, events and a wolf enclosure that is home to several live wolves. 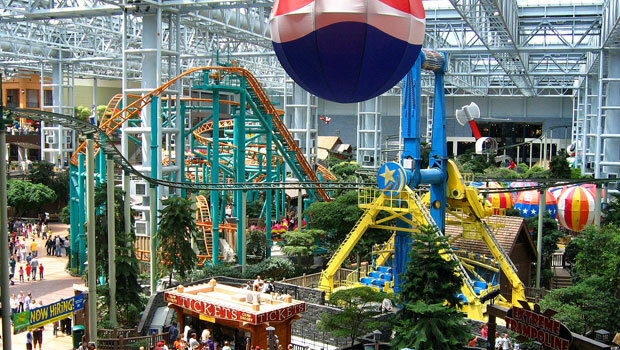 The Mall of America is the biggest shopping center in the United States and one of the most visited attractions in the world. The mall has 520 stores, 40 restaurants, the country’s largest indoor theme park and other attractions. The Minnesota History Center in St. Paul features a museum with interactive exhibits, tours, workshops and special events about Minnesota’s history. The museum is free to the public on Tuesday evenings. The National Eagle Center in Wabasha allows visitors to see many types of eagles, including bald eagles, up close. The center also hosts tours to see eagles in the wild. The North West Company Fur Post is a recreated fur post and Native American camp from 1804. Visitors can see what life was like for the Ojibwe people and for fur traders in the area by taking a guided tour, watching live demonstrations and exploring interactive exhibits at the visitors’ center. Browse a map of historical sites and museums in Minnesota from the Minnesota Historical Society. Ticket Exchange by Ticketmaster to buy or sell tickets from season ticket holders and fans. Stub Hub for tickets and last-minute deals. Browse a full list of college sports programs in Minnesota. Boundary Waters Canoe Area. Photo by Chad Fennell. 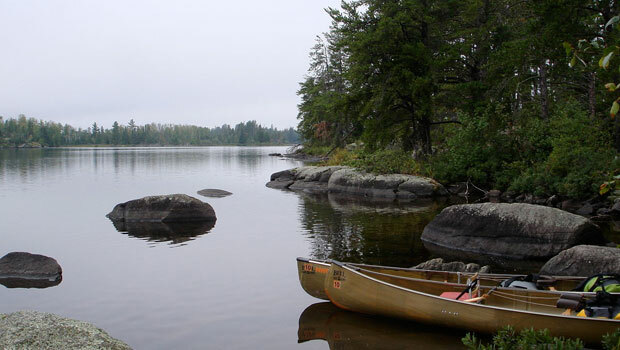 The Boundary Waters Canoe Area Wilderness is a popular area for canoeing, kayaking and camping. Find information on equipment rentals and guided tours from local outfitters in Grand Marais, Ely, Babbitt and Tofte. Forestville/Mystery Cave State Park has both Historic Forestville, a village that has been restored to its 19th century appearance, and Mystery Cave, the longest cave in Minnesota. There are multiple tour options at Mystery Cave and visitors can also go cross-country skiing, snowshoeing and hiking in the park. Grand Portage National Monument on Lake Superior tells the story of the Anishinaabeg Ojibwe Indians and the fur trade that once occurred in the region of the state. A museum and historic area contains artifacts, outdoor exhibits, historic buildings and other objects related to the Grand Portage area. Guided tours and outdoor activities, like hiking, picnicking, camping and canoeing/kayaking, are available in the area. Visitors may also want to go to Grand Portage State Park, located about 14 miles east of the monument. Skiing and snowboarding is a popular activity in Minnesota and there are many places to try it out for the first time or for experienced skiers and riders. Check out this list of ski areas in Minnesota to find a local resort. Spirit Mountain is known for its skiing and snowboarding, but it also has an outdoor adventure park and camping facilities. An alpine roller coaster, snow tubing, mini golf, zip line and mountain biking trails are available, depending on the season. Voyageurs National Park in northern Minnesota provides opportunities for canoeing, kayaking, fishing, ice fishing, snowmobiling, cross-country skiing, camping and hiking. Some areas of the park are only accessible by boat, while others can be reached by car, depending on the season. Many Minnesotans are of Scandinavian and German descent and this cultural heritage has influenced Minnesota cuisine, such as sauerkraut, sausages, krumkake, lefse and lutefisk. Other foods that were once included in Native American diets and continue to be eaten today include walleye (the state fish), trout, wild berries, bison and frybread. More recently, Mexican, Somali, Laotian, Vietnamese and Thai immigrants have come to Minnesota. Minneapolis has the country’s largest population of Hmong immigrants and visitors can find many Lao, Vietnamese and Thai foods in the area. Find a local farmers’ market in Minnesota for fresh fruit, vegetables and locally made items, including winter farmers’ markets, from the Minnesota Farmers’ Market Association. 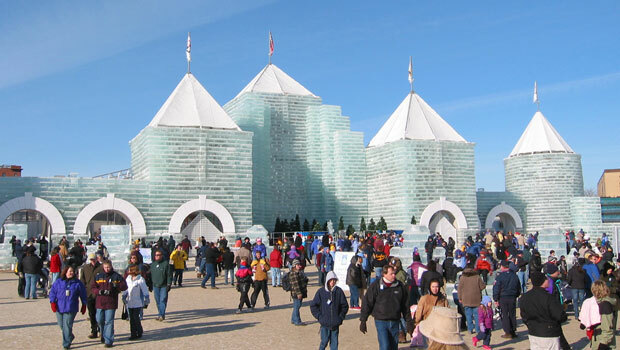 St. Paul Winter Carnival Ice Castle. Photo by Kendrick Erickson. The Saint Paul Winter Carnival in January/February is an annual community event with many outdoor and indoor events to celebrate the winter months in Minnesota, including ice skating, ice carvings, art shows, live music, dancing, parades, dogsled races and more. Eelpout Festival is a unique festival that celebrates the eelpout, a type of bottom-dwelling fish. Each February, thousands of people go to the small town of Walker for activities like live music, food, a fishing contest, games, a Polar Plunge and many other events. Minnesota Fringe Festival is a performing arts festival that focuses on modern and cutting edge artists. Held in the Twin Cities each August, the festival includes dance, theater, plays, music and spoken word performances. Moondance Jam is a classic rock festival held in July on Leech Lake near Walker, MN. Past performers have included Blondie, Cheap Trick, the Beach Boys, KISS and Pat Benatar. The Minnesota State Fair in Falcon Heights is the second largest event of its kind in the country, attracting over 1.5 million people during the 12-day event in late August/early September. The fair has livestock shows, cooking contests, carnival rides, food, live music, entertainment, and many activities and events for families and adults. The Minneapolis-St. Paul International Film Festival in April features films from independent filmmakers in the United States and around the world. The festival often features local films in its Minnesota-Made series, as well as many Scandinavian films due to the state’s cultural heritage. Metro Transit serves the Minneapolis and St. Paul area with bus and light rail service. To find public transit systems in other communities in Minnesota, visit the American Public Transportation Association website for a complete list of public transportation options in Minnesota communities. Bus companies with routes in Minnesota and surrounding areas include Greyhound and Megabus. Amtrak stops in Winona, Red Wing, St. Paul, St. Cloud, Staples and Detroit Lakes on the Empire Builder route. The train also connects to Greyhound bus stations where international visitors can travel on to locations across the United States. Food banks in Minnesota need groups and individual volunteers to help with tasks like sorting through donations, packing donations and other important activities. Volunteers can often donate as little as a few hours of time or commit to more regular volunteering opportunities. HandsOn Twin Cities helps to connect volunteers with over 300 non-profits in the Twin Cities region. Visit the website and search by interest, location and time commitment. Tree Trust works to preserve the environment in local communities across Minnesota. Volunteers can help with activities like planting trees, working in the office and distributing trees to the community. Twin Cities in Motion organizes the Twin Cities Marathon and asks for both group and individual volunteers to help throughout the year and during the marathon. Volunteers can work with other members of the community to help set up events, assist runners and other fun tasks.